In a world where schools focus more and more on academics and test scores to the exclusion of everything else, we seek to educate the whole person. It is our firm belief that a child’s emotional, moral, and spiritual development and growth is just as important as their intellectual and physical progress. While we base our educational philosophy in the best traditions of the Catholic faith, we believe in including students from throughout our community, from all faiths and backgrounds. 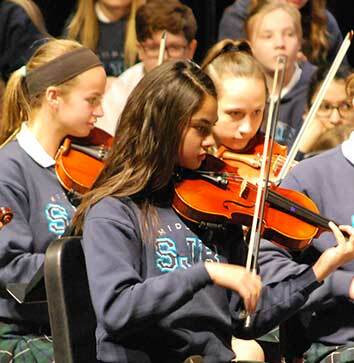 Since 1999, Saint John the Baptist Middle School has offered students and parents the opportunity to receive a complete education in a setting with strong spiritual values. Although the school is an affiliate of the Catholic Diocese of Salt Lake City, many of the students who attend Saint John the Baptist Middle School belong to religions other than Catholicism. Thanks to small class sizes and a modest student body size, Saint John the Baptist students are part of a closely-knit community. Together, we tackle challenging academics, explore our creativity through the arts, and unite in teamwork and dedication via athletic participation. Students also benefit from strong moral values and a dedication to charitable giving and good works. unique electives from Astronomy to Zoology and everything in between. class offerings in the performing visual, and fine arts.